JUMBO RHINO ROLLS are thick, absorbent industrial workshop wipers on a jumbo roll that are torn off to clean oil, solvents, chemicals as well as other liquids. These disposable wipes get their high absorbency capabilities from their high levels of wood pulp content. They are great at wiping away grease and grime off workshop tools and equipment and also make good oil absorbing cloths for any dangerous oil spills. Their thickness increases their ability to absorb most industrial liquids, including water, chemicals, fuels and solvents. The other component in the manufacturing of this wiper material is polypropylene, which gives the RHINO WIPES their strength, durability and smooth, low linting texture. Rather than taking on a challenging task with thin, short-lived wipes, manufacturing and engineering workshops favour RHINO WIPES, which are thick enough to withstand the tough demands of an industrial workshop, and are strong, durable and tear resistant, so unlikely to fall apart performing heavy duty tasks or when used with chemicals or solvents. 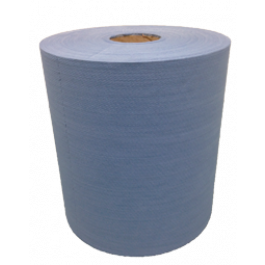 Each 151 meter jumbo roll contains 475 standard sized sheets (32cm x 35cm), perforated every 32cm to facilitate easy tearing off of individual wipers, which allows for standard sizes and reduced wastage. The rolls are portable and can stand freely on a worktop bench, however, if preferred, floor stands are available. The low linting characteristic of these wipers makes them great surface preparation wipers that can be used to prepare surfaces or cleaning sensitive machines and equipment of oils and industrial liquids without leaving lint behind after wiping. Low lint industrial cleaning tasks become easy with JUMBO RHINO ROLLS. So, if you are not already using the thick absorbent wipes from a JUMBO RHINO ROLL in your manufacturing workshop or factory to clean hands, tools and equipment, then add them to your next order of industrial cleaning supplies, and enjoy cost savings and the quality benefits that these strong, low linting, cloths provide!